You actually don't know what will happen to the weather when you're out of your home. Weather is unpredictable just by looking at the sky. Now If it's a clear sunny morning, the next moment it may start raining. There is a sudden change in weather. You have to be prepared for everything. Of course, it would be pointless to carry a cap on rainy day, instead of carrying umbrella. So monitoring the next few days weather will give you a rough idea on how to prepare yourself, if you're planning to go out of your home on weekend holidays. This widget is by AccuWeather. As you can see, it is showing temperature, date, time, location and other useful details. The user interface (UI) is very simple and elegant. 3D live wallpaper running in the background which makes it unique and awesome. Furthermore, you can get the weather forecast for the next few days and find out how hot and cold it would be exactly. You might also have similar widget pre-installed in your Android phone. To add it, first go to your home screen, then tap and hold the blank space for few seconds. After this, click "Widgets" option. Now find and tap the weather widget to add it on your home screen. You may be asked to fill your location details or it will automatically fetch them from your phone's settings. Note that, in order to get more accurate data, make sure to update it with internet regularly. First of all, open Chrome or Google app in your Android phone. Now type "Weather [Your city name here]" (without quotes) and hit search button. In the result page, you will find a geeky stats about your city weather forecast. Now move the slider to change time. Side-by-side, you can view the temperature, humidity, precipitation and approximate wind speed. 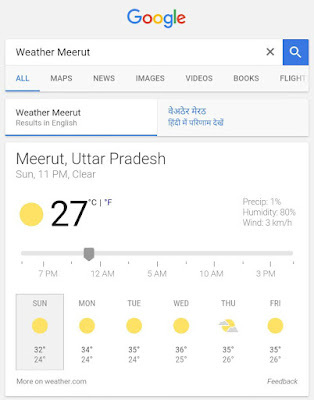 Google will provide you accurate weather updates for the next 7 days. Isn't that cool? AccuWeather - With over 50 Million users, AccuWeather is now the most popular and downloaded weather app for Android. There are various features it offers such as push notifications, news and weather videos. The Weather Channel - Another popular app similar to AccuWeather. It provides real-time alert, dynamic home screen, widget and world map. You can also visit The Weather Channel's website directly. Yahoo Weather - Yahoo's official weather app which provides detailed information and it has interactive UI. This app has been downloaded 10 Million times. 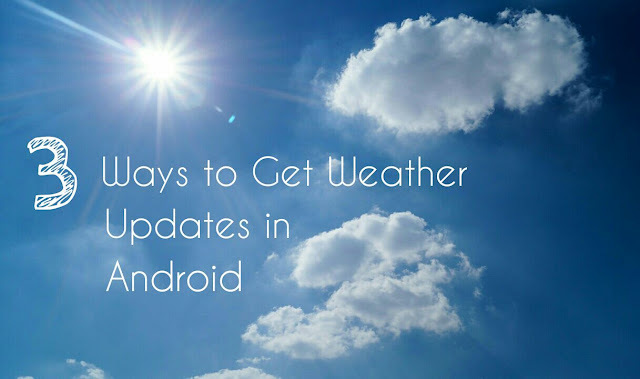 So these are some of the best methods to get weather updates in your Android phone. If you would like to add something in this tutorial, please do share it in the comments. types of Weather measuring instruments: there are various devices for predicting weather result. They are in digital forms, manual forms; there are different devices to measure weather related subjects. It is mandatory to have them from a reputed stationery store.